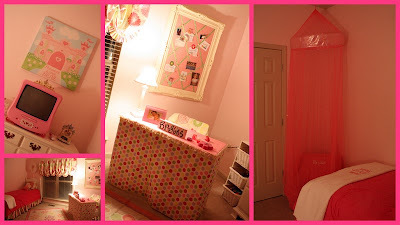 This weekend we made some renovations to Brylee's room! She is really enjoying playing babies and playing school and wanted all other things out of her room! She wanted us to make her a teachers desk that she could sit at and see all her kids in her class sitting on the rug. So that is what GoGo and I did... we also made her a reading corner too! She loved it! We still need a small bookshelf and a few more peace sign wall decorations and a few photographs framed and it will be all big girled up!